Bonne, R. - L'Isle de Cuba. L'Isle de Cuba. - Bonne, R.
Title : L'Isle de Cuba.. Size : 8.2 x 12.4 inches. / 20.8 x 31.5 cm. 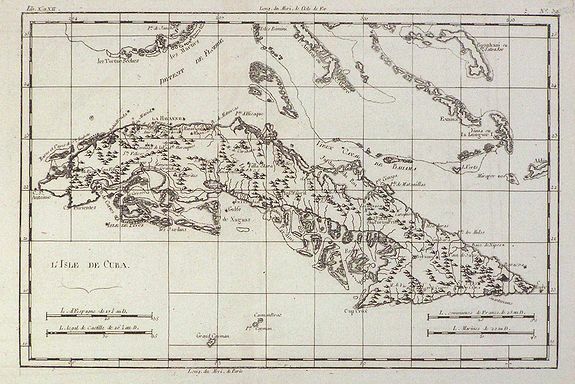 Description :Nice small map of Cuba, with parts of the Bahamas and lower Florida Keys. Bonne was a prolific hydrographer, working in the French Dépot de la Marine. This map is taken from Atlas de Toutes les Parties Connues du Globe Terrestre ... published by G.T. Raynal. Condition : Fine, on thin paper.